I’ve been using Strava Live Segments for about a week now on a Garmin 520. Whilst there is a bit to like about the functionality, I get the feeling that one of the following occured with respect to integration between Garmin and Strava. They both didn’t think about it. This is made obvious by the shortcomings of the functionality. Subsequently, there are some non-trivial problems with Strava Live Segments. To give you an idea of the problems, here’s a chat I had with my mate Chris. Be aware we have a tendency to over dramatise things. We’re also extremely discerning. And good looking. 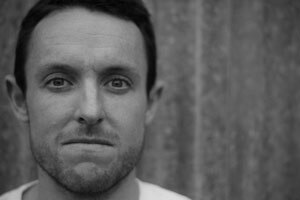 me: Where is the KOM alert? It’s just PR? It should say you need to push out this # of watts/kg or watts or speed. I used it on a KOM I used to have and pushed pretty hard and got to within 40s of my super fit time but would have appreciated W/kg or speed. “You are 300m behind” doesn’t tell me what I need to know. i.e. pov. allow me to castigate it. me: ON the time differences – the 520 tells you: distance and time. me: Can you send me a screeny next time? coz not everyone will update to a 520 or 1000 for the live segs. So, what’s to like about Strava Live Segments? The visual cues are pretty clear with a warning of an impending segment, then a “Go!”. You’re also made very aware of how far behind you are with a big red screen. I found being ahead didn’t give me a nice green screen and that made me 🙁 . It’s very fiddly to set up: below you’ll find a video I made about that. It sometimes doesn’t tell you the KOM time, just your PR. On an initial ride I seemed to have the KOM show up as the time to beat but upon checking local times, the KOM was another 5 or 6 people higher up. Bizarre. I then clearly had a KOM pop up as my training partner today. Inconsistency betrays poor design. The start and finish cues are often 50-200m out. In my experience, this means you’ll already be on an ascent when the starter’s gun goes. Not useful. The screen doesn’t change back to telemetry: it maintains a focus on the segment. This is ok if you’re close to the PR or KOM, but if you set a KOM years ago and you’ve now got a 7 month old baby boy and your riding has dropped off…well you don’t want to see your younger, fitter self spiral away up a mountain (see below). 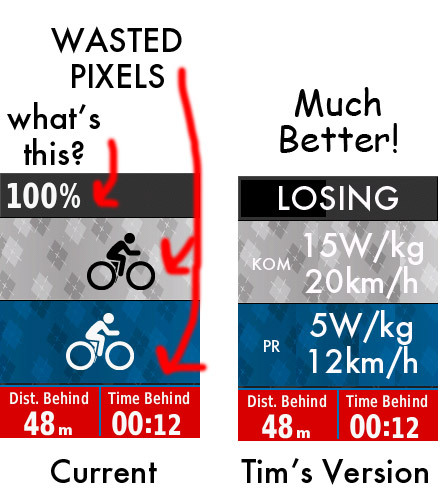 The comparison screen should be able to be configured to display the requisite watts/kg or speed or whatever that you need to do to either beat your PR or KOM. Here’s how it could look. The implementation across compatible Garmin devices needs harmonisation. In addition to addressing the above, I’d also look to build some audio cues. Apart from that change, and fixing the other shortcomings, I can’t think of anything else to improve it at this stage (though it’s likely Dear Readers will point something out, or I’ll think of something in the future). Strava Live Segments is a great idea, but needs serious improvements in order to address the shortcomings I’ve identified, namely 1, 2, 3 and 5 in particular. More broadly, the integration team at Garmin needs some high level directive to work closer with Strava (in case they’re not), or the two teams need to think about this from a user’s perspective. Or, more ideally, Strava needs to get into the hardware space to make this truly useful. At the moment it has some use, but until the utility improves, it’s a little gimmicky. I understand that most newer Garmin devices (anything except the 500 or 2xx basically) will get common firmware to enable Strava Live Segments. But, there are still a lot of 500s out there, which begs the question: should Garmin 500 owners upgrade? The Garmin 500 is an excellent device, and unless you feel like spending money on gadgets for a lark in order to get functionality like this, I’d stick with your trusty 500. If however, you need a new Garmin, then getting Strava Live Segments is a nice to have, not a need to have. Serious cyclists don’t train with Strava—they leave Strava to the school kids. In that case, a Garmin 500 is perfectly fine. However, if you need a new Garmin, please use one of the affiliate links below or in the sidebar. These affiliate links pay us a little pocket change to help keep the lights on. Strava Live Segments is a great idea, but needs serious improvements in order to address the shortcomings I've identified, namely 1, 2, 3 and 5 in particular. More broadly, the integration team at Garmin needs some high level directive to work closer with Strava (in case they're not), or the two teams need to think about this from a user's perspective. Previous Post: Quiz: What Oakleys Are You?